Savoury muffins hold such bright allure,atleast to me, no sugar,veggies,an absolutely delectable lighter twin to the sweeter muffin, these Eggless Cheese Muffins are made with cheese, they are high on protien,easy to just grab and go! Before I started making this I used to laboriously make mini Quiches instead but this muffin recipe has reduced my work so much! It’s a one bowl fool proof recipe! It’s a great basic savoury muffin recipe that can be tweaked to no end! According to me, Eggless Cheese Muffins are a best make ahead snack and breakfast option.I also love carrying these along with my super easy to make Chocolate Chip Ragi Cookies while travelling cause I don’t need to wreck my brains over the nutrient content and the nonsense that goes into store bought stuff.I could totally see these muffins in cute little tiffin boxes when my baby boy goes to school! But wait! You know whats the best part?These cheesy muffins are made with Semolina or Sooji/Rawa and not with Maida or Refined Flour which makes it so much more healthy.Sooji is less processed than refined flour which means it has more nutrients intact and higher fibre content too.Using Semolina also gives the muffin a great crumbly texture.I have used the fine version of rava here, what we typically make halva and Kesari with. Also also!Quite Obviously but I am still going to say this. My Semolina Eggless Cheese Muffins have no sugar in them cause it’s Savoury(silly!) so you get to save on the empty sugar calories too. Are Eggless Cheese Muffins Child/ Baby friendly? These Eggless Sooji Muffins are very child and baby friendly.While baking it for my 10 month old baby,I omitted the salt and I can’t tell you how happy I was that he actually ate some of it instead of flinging it at me like a monkey. Before I digress let me also tell you about some other child friendly snack options I have on the site- try my nutrient packed Ragi Chocochip Cookies, Healthy Chocolate Bliss Balls & Healthy Peanut Butter Cookies. These are my personal favourite go to recipes when I am travelling and need a quick handy snack for both myself and my baby boy. But the best part is yet to come..okay the second best..actually that depends on your perspective but here it goes.Another obvious fact-These muffins don’t have any eggs and is made from the humble homemade Curd/yogurt. I have used regular Cheddar Cheese instead of the processed cheese.I somehow have my doubts on the ingredients of processed cheese especially since I read somewhere(random I know) that processed cheese has more than 40% of non milk ingredients. Whhhat! I know! Are there any variants of these Eggless Cheese Muffins? You can make these with any vegetables you would like.This recipe will work great with peas, sweetcorn,spring onions, beans,beetroot and spinach too. You can also add a nice rava idly inspired tadka(tempering) with oil, mustard seeds, curry leaves and some cut coriander, and a generous dollop of chutney would enhance the flavour even more. 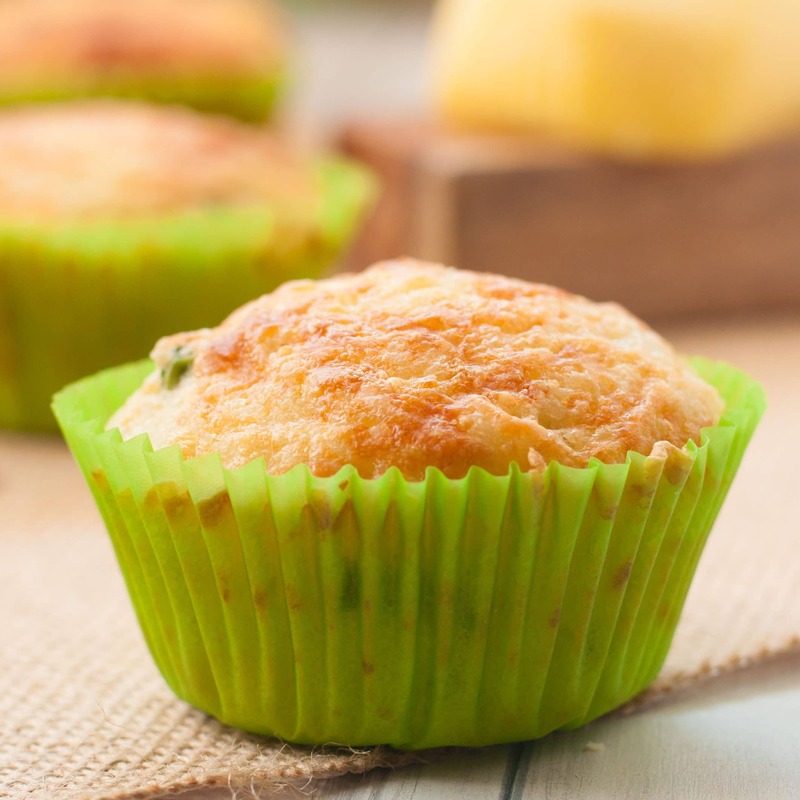 To make a non vegetarian version of these make ahead breakfast muffins, just add some cooked chicken or bits of boiled egg or bacon to the batter before pouring it in the muffin cups. Is this a Breakfast Muffin? I wouldn’t pigeon hole these Eggless Cheese Muffins in the breakfast category because I can have these at any given time of the day. Add the curd and water to the Semolina. Mix in the salt, grated cheese and vegetables. Prepare the Muffin pan with the muffin cups. Add the Baking Soda to the semolina mix.Using a spatula mix it well. Scoop in the mix into prepared muffin cups.Garnish with grated cheese. Bake at 180 degrees for 20-22 minutes. Other recipes that you will absolutely love! Hi. Is the rava you used in the recipe roasted? No I haven’t roasted the rava for this recipe. They should keep for a few hours or even a day on a cold place. But in a hot place I wouldn’t take too many chances..